Flickers of a Faithful FireFly: I've Been Tagged!! Sam from Journey Through Faith tagged me for Six Random Facts. My very first tagging! 1) Link to the person who tagged you. 2) Post the rules on your blog. 3) Write 6 random things about yourself. 4) Tag 6 people at the end of your post and link to them. 5) Let each person know they have been tagged, leave a comment on their blog. 6) Let the tagger know when your entry is up. 1) I am back in school now, at the age of almost 52. I am going to finish my bachelor’s degree which I began at Colombia College Chicago many, many years ago. Back then I was working toward a major in Fiction Writing. Now I am a distance student at Christian Leadership University. God changes some things, but others remain the same, for I believe I will be majoring in Prophetic Ministry and Christian Arts (still writing). 2) I love cinnamon, the look of it, the smell of it and the taste of it. It is warm. It is spicy. It is comfort to my bones. 3) I have an unusual affection for two of Hallmark’s most popular e-card characters Hoops and Yoyo. I have stuffed Hoops and Yoyos. I have a Hoops and Yoyo Christmas cd. I fantasize about Hoops and Yoyo creating a worship album, for I just know that their worship would be extravagant. 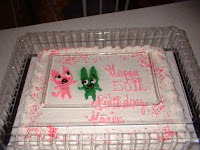 No, I do not quite idolize them, but, Rick did have them put on the cakes for my 50th birthday party! 4) I have a 5 disc stereo in the bedroom that I load up with worship cds and let them play through the night as we sleep. It improves the atmosphere. The devil can’t stand when anyone worships God and just can’t bring himself to hang around! Often I will wake up to hear exactly the lyrics God needs me to hear. 5) God has given me the gift of hearing the sound of chimes when He desires to speak to me about something. 6) I try my best to appreciate all of God’s creation, but for the life of me cannot quite understand why he made mosquitoes. Here in Manitoba they’re often called the provincial bird. Thank you for tagging me; My post is up. The smell of cinnamon is so wonderful...sometimes I improvise a potpurri by boiling water and adding cinnamon in it to fill the house with the smell of cinnamon. I am glad you did this!! I too love the smell of cinnamon, I have a teapot mat that smells of cinnamon as the pot warms the mat! I wish I could wake up to music too, but I can't leave my hearing aids in all night as they whistle and make my ears uncomfortable when I put my head on the pillow!! A great bunch of six random facts, thanks for doing this! I am wondering about the mosquitoes too! LOL!!! Hoops and YoYo are too cool! I will get it up asap! I really enjoyed this so much! Thank you for including me! I have mine posted here... http://weirblessed.com/faithprints/?p=330. The chime thing is really neat. When someone is talking to me that has a false spirit, I see a STOP sign. Isn't it funny how God knows just how to speak to each of us? Hi! You're the second person to tag me with this....I'll get to it as soon as I can! Not just another boat ride!